The following tutorial shows all the features of listing subscribers. In the left menu click on a list. In the right frame the subscribers' list of the list will be displayed. Below the tabmenu the name of the list appears and at the right hand side there are two buttons: "Print" and, "Export". 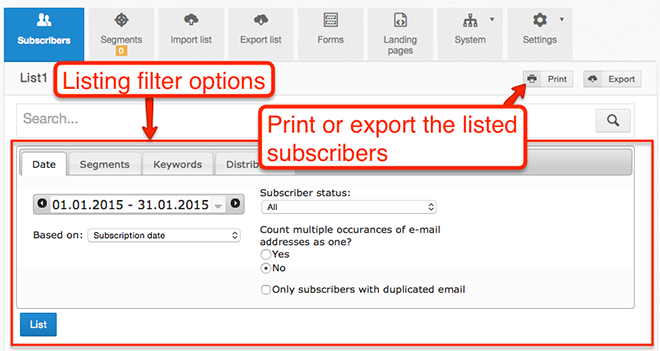 With these you can print or export the listed subscribers. An-another tutorial explains how to do this. Date: this tab appears by default. On the left side, there is the time period selector. If you click on it the setting options will be displayed. There are several predefined settings (this month, last month, this week etc.). 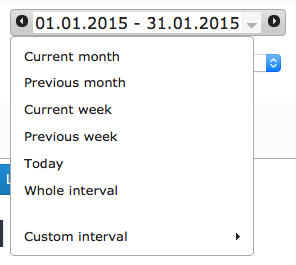 If you want to select a custom interval click on the "Custom interval" option and select the start and end date of the interval. In the Subscriber status dropdown list you can filter subscribers by status. 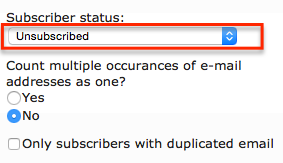 If you choose "Unsubscribed" status, a new option will show up under the dropdown list. If you want to list subscribers by their unsubscription date choose the "Date of unsubscription" option. On the graph the unsubscription dates will appear and their color changes to red. Similarly if you filter to "Inactive due to invalid e-mail address" status you can select by what date you want to list subscribers. On the second tab you can see the segments of the list. You can filter subscribers by the segments they are in. If you select more than one segment then the subscribers that are in at least one of the selected segments will be listed. The third tab is the "filter by keyword". The type keyword or expression will be added to the filter. By default the filter searches the keyword in all fields. If you want to search the keyword in certain fields only uncheck the "Search in all fields" option and check the desired fields. The fourth tab, Distribution is not a filter option, but it shows the value distribution of given fields. It's optimal for the evaluation and analysis of polls or survey results. Read this tutorial about it. To apply the settings for the subscribers' list click on the "Filter button" right below the filter tabs. Important: all the filter options set on the three tabs will be applied for the listing of subscribers. So if you set a certain time period and a segment the results will include all the subscribers who are subscribed in the given period AND who are in the given segment. 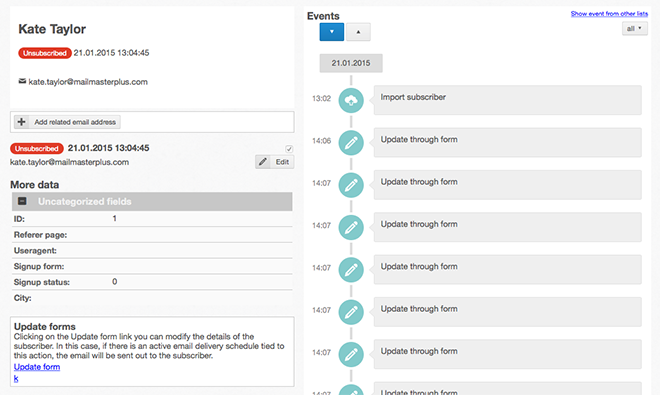 If you want to list all the subscribers in the given segment set the time interval into "Whole interval" and select the segment you want to filter on and press the "Filter" button. It is also important that SalesAutopilot stores your time interval settings and remembers them the next time when you list subscribers. 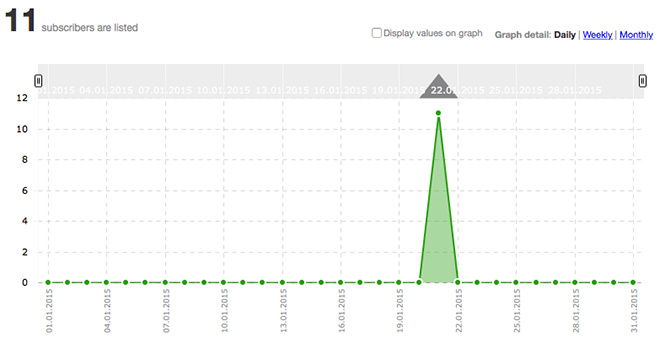 Below the filter options the graph shows the distribution of the listed subscribers in time. 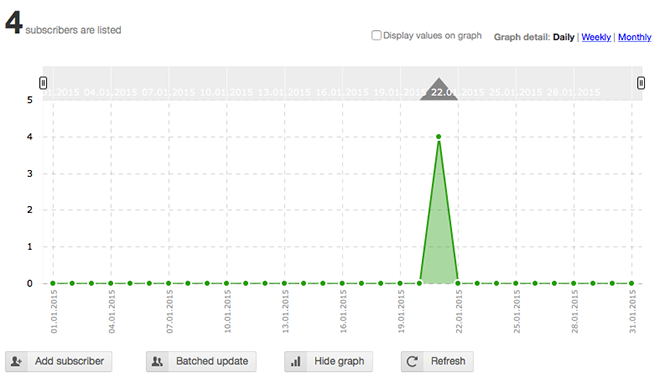 You can change the time resolution of the graph at the top right corner to daily, weekly or monthly. Click the display values on the graph if you want to see the values of each point on graph. You can zoom into the graph by selecting a certain part of it (click with the left button of the mouse, hold down the left button and move the cursor to increase the selected area then release the left button). Below the graph you can see the list of subscribers. The fields that appear are the ones you checked in the edit field settings and they are in the same order. If you want to change the displayed fields or the order of the fields go to the edit field settings and do these changes. After that the subscribers' list will appear according to the changes. The subscribers' list is ordered by the first field of the columns and a small arrow indicates that. If you want to sort the list by a different field click on the name of the field. The small arrow appears next to the field name and the list automatically reordered. Click the e-mail address of the subscriber to show his/her personal profile page. On the profile page you can see all the details of the contact and the complete history of events happened. In the subscribers' list click the icon to edit the subscriber. A layer will be displayed. Simply modify the data in the input fields and then click the "Save data" button at the bottom. To delete a subscriber click the icon next to the subscriber. To delete more than one subscriber at the same time check the checkboxes next to each of the subscribers you want to delete and click the "Delete marked subscribers" at the bottom of the list. At the bottom there is a pagination option. Use the and icon the show the next page of the list. You can select how many subscribers you want to list per page at the "Rows per page" dropdown list. 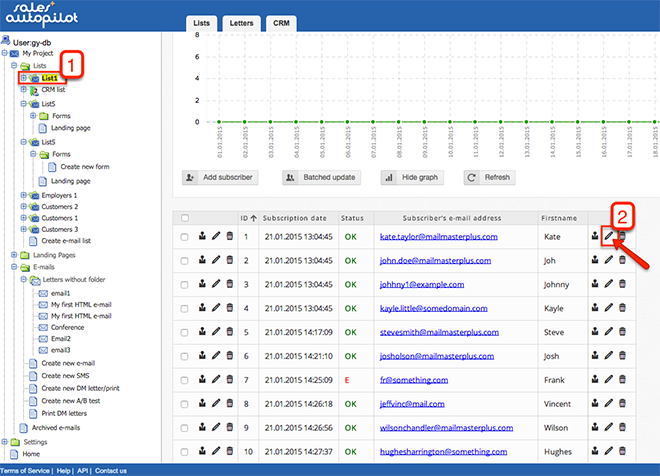 SalesAutopilot stores your selection and remembers it the next time when you list subscribers.